How the medical profession acquired its modern shape is one of the headier topics tackled by Burke and Hare, a based-in-fact black comedy about 19th century grave robbers William Burke (Simon Pegg) and William Hare (Andy Serkis) and an infamous series of murders that sated the demand for experimental cadavers in the renowned surgical schools of Edinburgh, Scotland. When a skilled doctor (Tom Wilkinson) is blocked from acquiring legal corpses by a regressive rival (Tim Curry), he welcomes the sudden influx of bodies brought in by the Williams - even though he's well aware that there is nothing natural about the causes of death. Soon enough the authorities start noticing the epidemic of missing persons, putting Pegg and Serkis' enterprise in the criminal crosshairs as they try to help advance the medical field. 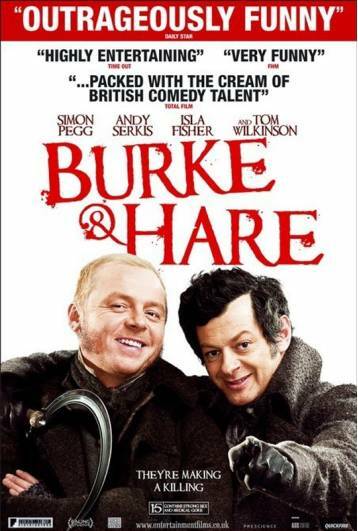 Yet it gradually becomes clear that Burke and Hare isn't a movie about medicine, but economics. In quite a literal way, it comments on the selective amnesia that often accompanies societal sea changes. It's easy to forget how some lives are thrown in the grinder (or onto the operating table) in the name of progress. The movie even seems committed, however modestly, to providing a little historical perspective. An oddball subplot about the development of photography and its role in advancing the understanding of human anatomy underscores the film's surprising level of detail. However, the rest of the movie doesn't successfully build upon these vague thematic notions, or make them terribly funny for that matter. Pegg and Serkis' first few misadventures in murder-for-hire are amusing but become nothing more than a wacky diversion once Isla Fisher is introduced as Pegg's love interest, a former prostitute who dreams of finding a wealthy patron to finance her all-female production of Macbeth. Pegg's horniness suddenly supplants economic desperation as his main motivation, and his questionable romance subjects the audience to heavy-handed parallels between Shakespeare's Scotland-centric play and the situation at hand. Burke and Hare splits the difference between charming throwback and antiquated museum piece. It's a glaringly unsubstantive film, a mixed bag of slapstick and consequence-free comedic setups that's more at home in 1985 than 2011. But there's something comforting about a movie that doesn't ask you to do much more than spot the trademarks of a Landis-directed comedy - memorable bit players and director cameos and a conflict that escalates into a wry, matter-of-fact brand of mayhem. 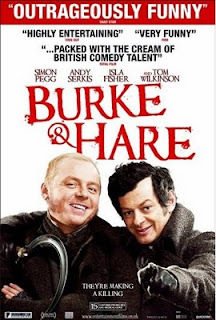 Burke and Hare might not be a truly hilarious or original comedy, but it's definitely cornered the market on affability and nostalgia, right down to the freeze-framed snippets of the principal cast right before the end credits roll.